Something new and a bit different for the blog today. This will be the first in a new segment on the blog called 'places and spaces' looking at interesting workshops, studios & creative spaces. Recently I was lucky enough to get a look behind the scenes at the Workaid workshops, in Chesham and to see the fantastic work which they do there. The Workaid building was historically an old boot factory, and I think it's fitting that it continues to be filled with people doing traditional and skilled handiwork, making and mending. For anyone thats not aware of Workaid and what they do - Workaid are a charity that provide tools and teach trade skills to the disadvantaged and the vulnerable in Africa, in order that they can earn from it and provide for themselves and their families. They also support many projects here in the UK, all based around traditional skills and craftmanship. 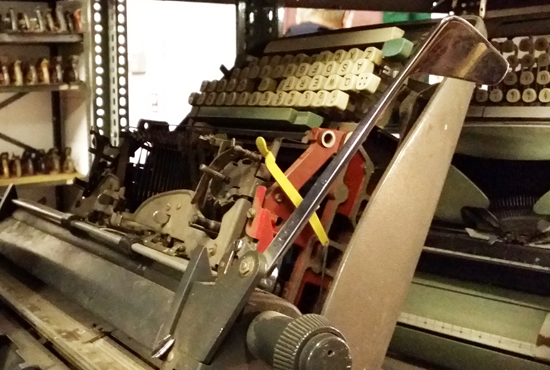 The warehouse receives donations of all kinds of tools and machinery, in various states of disrepair. It could be a lawnmower, sewing machine, typewriter, hammer, fabric, bike or pretty much any kind of tool or piece of equipment you can think of. They really do have it all! The donations are lovingly sorted and cleaned, skillfully restored or repaired and then carefully packaged up into containers. They send on average 8 containers a year, using donated clothing and fabrics as wrapping material which can be used at the destination - a genius idea! 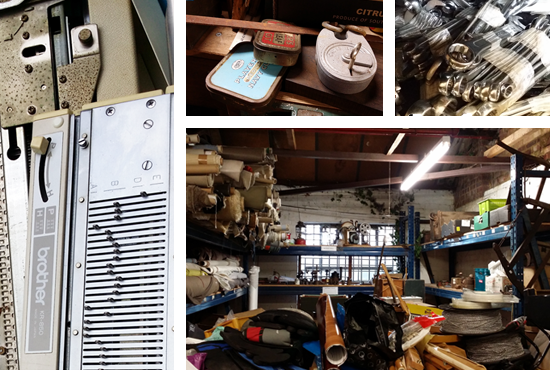 Its hard to do justice to the scale of the operations at Workaid and the vast amount of interesting objects; these pictures are merely a snapshot. With only 4 paid staff, 3 of which are part-time, in the charity, the whole operation is supported by a team of dedicated volunteers, some of whom are retired engineers and crafts people. 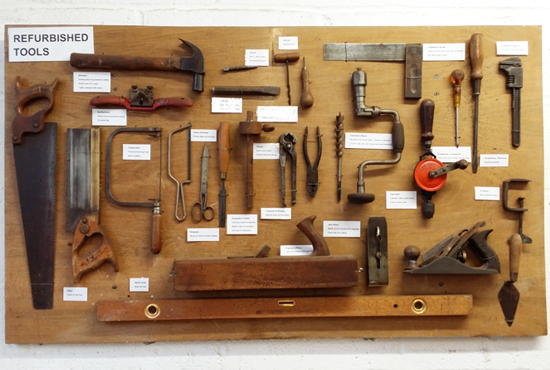 One day they may be sandblasting rust from a pile of donated chisels, the next taking apart a mysterious vintage tool to see how it works and repair it, giving new life to many interesting and forgotten objects. It's brilliant! Anything that is beyond repair is carefully taken apart for recycling or selling as scrap metal. Items unsuitable for shipping are sold in the Workaid shop or at one of their legendary forecourt sales. Vintage and fleamarket enthusiasts take note! 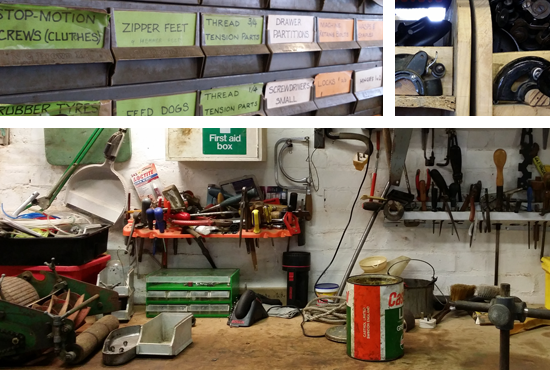 The workshop is a 2 floored hive filled with bountiful shelves, drawers, boxes, piles and crates. 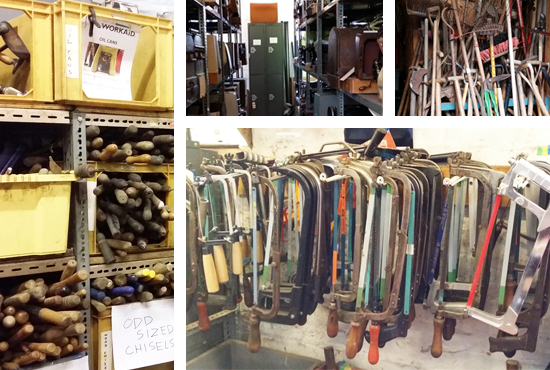 Rows of vintage typewriters, a host of old sewing and knitting machines, a 50's electric drill here, a 20's sock making machine there...crates overflowing with hammers and mallets of all sizes, a wall of neatly organised saws, a huddle of rakes, spades and hoes, a room of bikes & lawnmowers. Every nook and cranny is peppered with an eclectic mix of other interesting objects and ephemera from past and present. There is so much to discover, I could have stayed there all day. The density of the collection is broken only by pockets of workspaces, benches with glues, tapes and tin cans, radios and mugs of tea. The whole rich aesthetic is one that I love, and the smell of sawdust, oil and metal is strangley nostalgic and comforting to me. I'm reminded of my time spent at the puppet workshop, of fiddling about in my gran's button box as a child and of watching my Dad at the end of the garden in his homemade workshop; he was always making or mending something or rolling about under a rusty car. Swamped in an abundance of bits and bobs I was amazed how organised the whole place was (though they were too humble to agree with this!) Everything, no matter how small, has a place or a drawer with its name on it. So much so, that when the packers are tasked with putting together the goods for a project, they have a shopping list of items and can go around collecting everything they need, ticking them off as they go. In addition to the workshop, the forecourt sales and the Workaid shop, they also hold 'craft and coffee' mornings and hold sessions for teaching the learning disabled useful skills within the building. They are a very enthusiastic and inclusive charity that succesfully engage with both the local community and those many miles away. They certainly inspire me to keep making and mending, recycling and reusing, and to keep learning new crafts and skills. The hard work and generosity of the charity and the volunteers really is awe inspiring - you should definitely head down to one of the forecourt sales, follow them on facebook or twitter, and check out their website for more information on the amazing work which they do. The Workaid Shop is open Thursday - Saturday 10 to 4. The next forecourt sale is Saturday March 21st - get down there and find some treasures!